The Makers Empire Learning Program utilizes 3D printing technology to promote design thinking and help students become better real world problem solvers. We transform 3D printing in the classroom, helping you integrate it into the curriculum and provide all the tools you need. Step 3 – Select the Makers Empire Package that fits with your project idea. 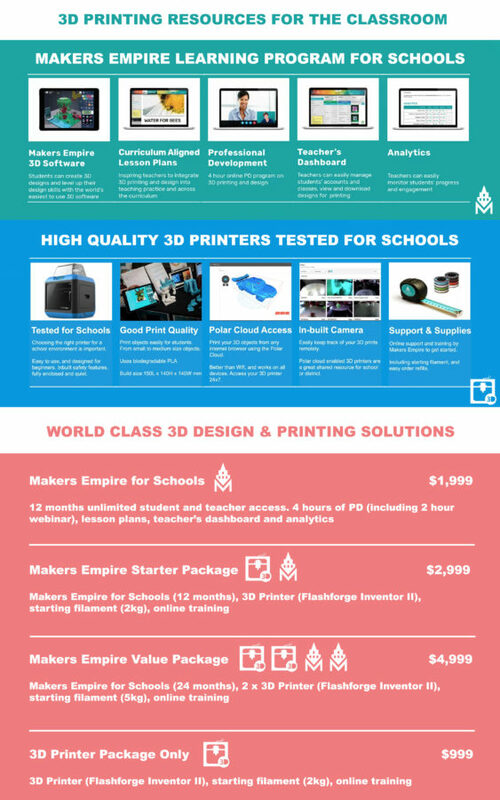 For example the Makers Empire Value Package ($4999), comes with 2 years of the Makers Empire Program including unlimited teacher/student access, lesson plans, professional development and 2 medium 3D printers (filament, online training included)! Depending on your project idea, choose the right Makers Empire package for you.